Ms. Steel, Ms. Steel, tear down this hedge. To accommodate his grand chateau, Spreckels bought and combined several prime lots with views of the San Francisco Bay and the Golden Gate. Mrs. Spreckels insisted on saving the existing Victorian houses. Six house on Jackson Street and two on Washington Street were moved. Adolph Spreckels was the son of sugar tycoon Claus Spreckels. He inherited and expanded his father's empire, to include sugar cane in Hawaii and sugar beets in the Salinas Valley along with the necessary refineries. Alma le Normand de Bretteville, the daughter of poor Danish immigrants, was born in the Sunset District. Her beauty and taste for fine art led her to model for local artists most notably for sculptor Robert Aitken who placed her likeness atop the Dewey Monument in Union Square. At about this time, Alma was introduced to Adolph who courted her for five years before marrying her in 1908 when her was fifty and she was twenty-four. Alma continued her interest in the fine arts. 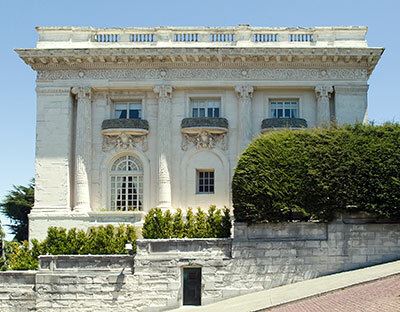 She purchased a number of major works by Auguste Rodin and commissioned Applegarth to design the California Palace of the Legion of Honor in Lincoln Park to house them. 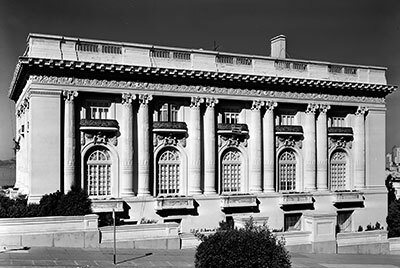 This building, a copy of the Palais de la Légion d'Honneur in Paris, is now part of Fine Arts Museums of San Francisco. It houses Alma's Rodin collection and is by far the loveliest and best sited of San Francisco's museums. Adolph Spreckels died in 1924. Alma de Bretteville Spreckels died in 1968. See the Encyclopedia of San Francisco for the complete story of Alma and Adolph. 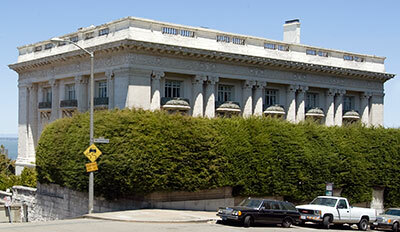 The Spreckels Mansion had a supporting role in the 1957 movie Pal Joey playing Frank Sinatra's nightclub Chez Joey. The 1960 photograph at the top of this page was taken when Alma de Bretteville still lived here, and she remained here until her death from pneumonia on August 7, 1968. She bequeathed joint ownership of her home to her two daughters. Until the current owner moved in, the Spreckels Mansion looked as it did in the 1960 photograph, a jewel that any San Franciscan or tourist could admire, unobstructed by inappropriate hedges. The bottom photograph was taken in the courtyard of the California Palace of the Legion of Honor, Alma Spreckels incomparable gift to San Francisco. 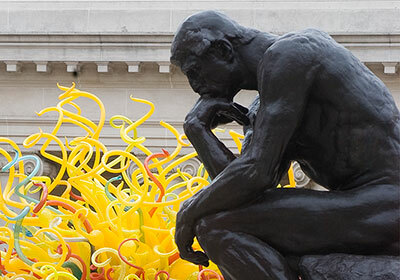 It shows the permanent installation of The Thinker by Auguste Rodin and a temprary installation of the 1999 blown glass work, Sun, by Dale Chihuly.